As a Level 1 supplier for Marks & Spencer we became the go to supplier for high quality, large volume shop signage. 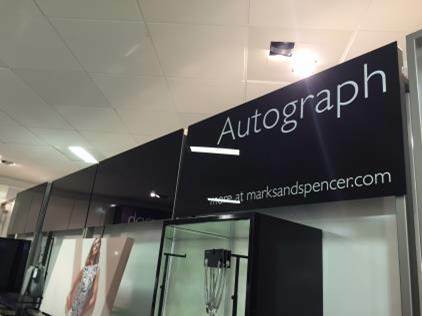 The Autograph divider wall sign is just one of our successfully completed projects for M&S. Autograph is one of the High Street retailer’s most popular and prestigious clothing labels. Signage needs to support the brand but be cost-effective and long lasting too. The Autograph divider wall signage required crystal clear white print on a high quality black acrylic. In total we manufactured over 1000 signs over a three year period – all of the same exacting quality for use in branches from Perth to Penzance.